These are really good and crispy. 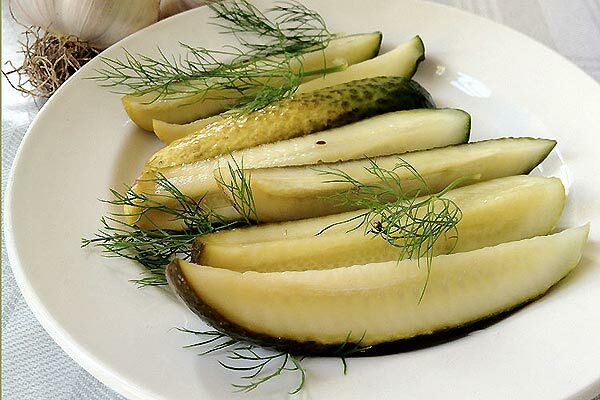 I really like these pickles because they are mild, keep their crunch and go great with burgers at a barbeque. I make them as much as I can when we can find the right cucumbers at the market. They remind me of the pickles you get in New York diners when you order a Cheese Burger Deluxe. Check out my recipe for Coleslaw to make the deluxe part of it. These are really good and crispy, great with burgers or almost anything from the barbeque. 120 ml cider vinegar you can sub white wine vinegar. 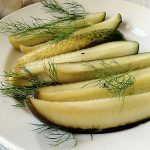 Wash well and cut each cucumber into 4 long spears. In a pot bring to a boil the vinegar and sugar. Remove from heat and add the rest of the ingredients stir well. Place the cucumber spears into the sterilized jars and pour the warm vinegar mixture over them. There should be just enough to cover the pickles. Shake the jar to distribute the seeds and garlic and leave overnight in the refrigerator. The pickles are ready in 24 hours and keep for about 7 days. These are really good and crispy, because they aren't pickled to last for storage they keep there crispness. Unfortunately for us here in Sweden, Kirby's or Västerås gurka are only available in September. Use a jar that is just large enough to hold the pickles.